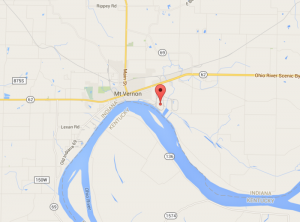 Contiguous to the Ohio River, Ports of Indiana–Mt. Vernon is the 7th largest inland port in the United States and serves as a major multi-modal hub for the region handling over 4 million trip tons of cargo a year. It is one of the major transportation engines for not only Posey County but the State of Indiana. Originally created as “Southwind Maritime Center”, the Ports of Indiana–Mount Vernon has become a national leader in throughput tonnage, handing 4 million tons of grain, grain products, coal, fertilizer, cement and minerals annually. This river port is one of the richest grain productions areas in the world, and Port of Indiana’s mission is to create a world-class port system that is dedicated to growing Indiana’s economy. Connected to the Inland Waterway System via Ohio, Mississippi and Illinois Rivers. Year-round access to international ships in Chicago, IL, Mobile, AL, New Orleans, LA and other sites via these waterways. Five Class I Railroads move your goods via rail and road. More than 600 acres available for industrial development, including a 500-acre megasite. Largest public port within 175 miles of the Ohio-Mississippi Rivers intersection. Ranked 7th in the US waterborne shipping & 15th in total domestic/international shipping. 58,000 sq.ft. of warehouse storage. 50 acres of outdoor storage. View the video about Ports of Indiana – Mt. Vernon.